Minimum: 10 boys. Maximum: 30 boys. 1 Adult required to attend with every 5 boys. 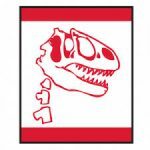 o Learn about and identify the dinosaurs at the Dinosaur Discovery Museum. o Create a fossil cast. o Discover how paleontologists look for and excavate fossils. o Be a “paleontologist” and uncover dinosaur fossils.